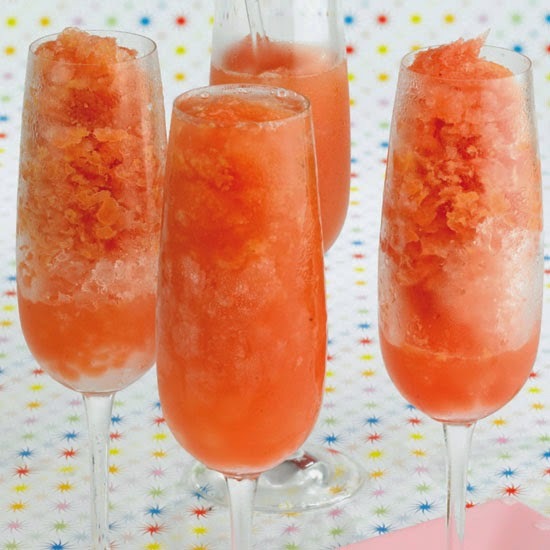 Buck’s fizz, a delicious cocktail made with equal parts of orange juice and champagne or sparkling white wine, becomes a gorgeous granita when made with blood orange juice and frozen. If you want, try diluting the granita with seltzer, champagne, or even sparkling cider for parties and special occasions. Chill 6 tall champagne glasses or another tall glass for as long as possible. Mix the ingredients together and freeze for several hours without stirring, until frozen hard. Scrape with a large fork into a granular mixture and return to the freezer until ready to serve. Fill the iced glasses with the granita and serve immediately, with a teaspoon, or top off the glasses with additional Prosecco or another sparkling beverage and serve quickly. Prepare the basic recipe, replacing the orange juice with peach juice. Serve with a slice of fresh peach. Prepare the basic recipe but replace the orange juice with kiwi juice. Replace the orange juice of basic recipe with the strained juice of summer berries. Prepare the basic recipe, replacing the orange juice with strained strawberry juice and adding a shot or small measure of cassis before freezing. When preparing the basic recipe, replace the orange juice with puréed and sieved melon and add a shot or small measure of Midori or melon liqueur before freezing.